After a scary bout with meningitis at the age of four, Cece lost her hearing. Now in middle school, she has some added challenges both in class and in making friends. Some kids talk really loudly and slowly, which actually makes them more difficult to understand. Some laugh when she mishears them. Some ask questions about her hearing aids. On the other hand, she feels like she has special powers. Her teacher must wear a transmitter for the hearing aid which means that Cece can hear her not only during class, but in the teacher's room and even in the bathroom. In her imagination, Cece isn't that awkward weird kid who stands out because of the cords coming out of her ears - she is El Deafo. I think El Deafo is geared towards middle grades, but as with many great books for kids and teens, there's loads of appeal for adults too. We all remember our best friends growing up, and how there could be a new best friend every year, and the way that some friendships ended. 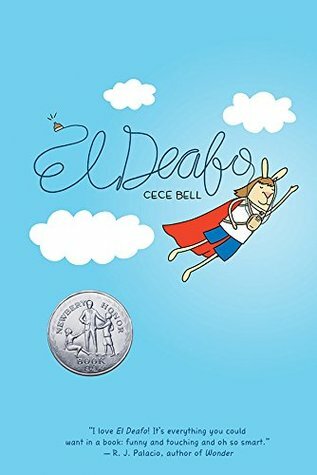 Particularly poignant were the situations in which Cece found herself unable to express what she felt: in her imagination, her El Deafo self would come right out and tell someone what she thought, but the real-world Cece was afraid to speak her mind. This led to unhappy situations, like remaining friends with someone who wasn't very nice to her, and who she didn't want to be friends with anymore. Cece experienced a lot of strange comments and behaviors because of her disability, which she didn't really consider a disability. (This was an interesting point, because I have a nephew who is deaf and I think the first time someone referred to his "disability" I was very surprised. I sort of thought, "He's not disabled. He just can't hear!") When some friends invited her to a slumber party, she had a little trouble following conversations and couldn't at all understand the tv, not to mention that one of the girls kept trying to teach her sign language. But when they all decided to talk with the lights out and Cece wasn't able to lip read or rely on visual clues, she decided it was time to go home. In her imagination as El Deafo, she responded to a barrage of questions from one of the girls. "What are those cords for? Why do you wear overalls so much? Are you DEATH?" El Deafo brazenly answers, "Yes, I'm death! And you are next on my list!" Cece also had some good friends and fun times as well, so it's not a downer of a book at all. It's a more-or-less true account of events from the author's childhood, and I found that it felt very genuine. She really captured what I remember middle school being like. I can't believe I've gotten this far through the post without mentioning that it's a graphic novel, but one of its charms is that all the people are drawn as human-like rabbits. It's very cute. El Deafo won a Newbury Honor Award and has received lots of praise. I found it cute and endearing and an entertaining way to spend an evening. If you think you might like a graphic novel about a middle school kid just trying to fit in, you should give it a try!